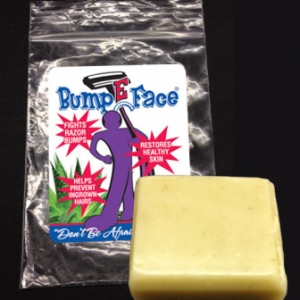 BumpeFace Razor Bump Fighter Single 1.7 oz Bars, excellent if you just want to Try BumpeFace! SKU: 8-54809-00399-7. Categories: Men, Professionals, Women. Design for both Men’s and Women to help deal with razor bumps and burns on the faces, necks, legs, under arms, and bikini lines. 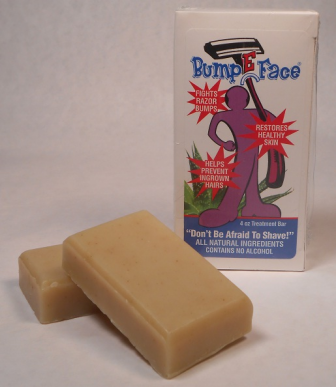 BumpeFace is specially formulated with a blend of lubricants and moisturizers to help reduce the chance of Ingrown Hairs & Razor Bumps caused by shaving, waxing or electrolysis. 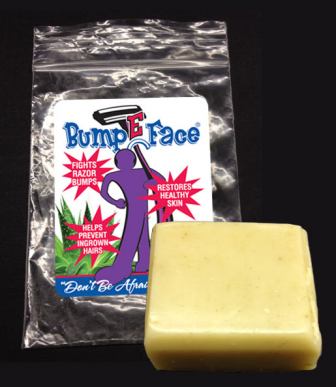 Bumpeface is made with all natural ingredients and Mother Natures way to prevent razor bumps and restore healthy skin. It contain no alcohol, so there’s no smell and no burning when applying like other brands. It is specially formulated to removes impurities as it soothe and restores healthy skin. Tea Tree Oil - Helps healing skin cuts, burns, infections, and has antifungal action. Bentonite Clay – Highly absorbent and good for oil skin. It gives a slippery silkiness which makes it good in shaving. Kaolin Clay – A mild, white fluffy clay, good for light mask or scrubs, and gives a silkiness and creaminess feel. Calendula – Used to sooth sensitive or irritated skin, used topically to treat acne, reducing inflammation, controlling bleeding and soothing irritated tissue. Chamomile – Anti-inflammatory and also as a mild sedative, helps to reduce redness and is soothing on inflamed skin, and reduce minor skin irritation. Aloe Vera – Helps to prevent razor burns, and also protects against sunburns. Coconut Oil - It’s excellent as a skin moisturizer and softener. Razor Bump Prevention - Apply to infected area as needed, use a sterilized needle to remove imbedded hair, avoid pull hair to prevent skin damage. Pre-Shave - Apply before shaving to sooth sensitive or irritated skin, helps prevent cuts, burns and infections. Shaving Cream - Simply latter, apply to shaving area, it gives a slippery silkiness and creaminess latter during shaving. After-Shave - Apply after shaving to reduce irritated skin, inflammation, controlling bleeding and to soothing irritated tissue. Using BumpeFace is as simple as washing your face. 1.) Moisten face with warm water. 2.) Apply BumpeFace to shaving areas. 3.) Rinse face using warm water. Allow face to dry and apply lotion or moisturizer as needed. All BumpeFace Products are made-to-order to ensure you receive the freshest products available, due to the handmade process; some colors and scents may vary slightly. Orders are generally shipped out within 1-2 business days of receiving cleared payment. Our items are made upon order to give our customers the freshest product possible, and this may delay the delivery date. Most orders will be shipped USPS Priority Mail, however some larger orders may be shipped UPS or FedEx to help keep your cost of shipping down. All orders shipped outside of the Continental States will be shipped USPS and additional shipping charges will be incurred and confirmed upon return email. Thank You for Viewing Our BumpeFace Product! Shopping is Safe, Secured and Gauranteed. 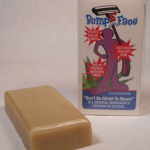 Be the first to review “BumpeFace Razor Bump Fighter Single Bar” Click here to cancel reply.